OMG - what have I done here. 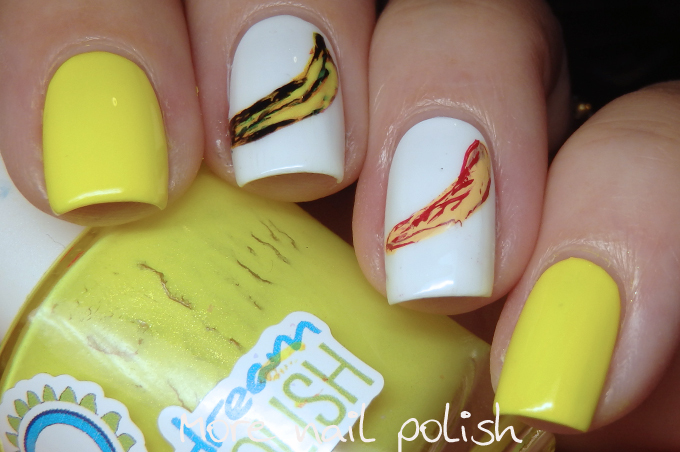 Yes, I have bananas on my nails. They look very odd, except when I put the inspiration album covers next to them and then they almost look ok. 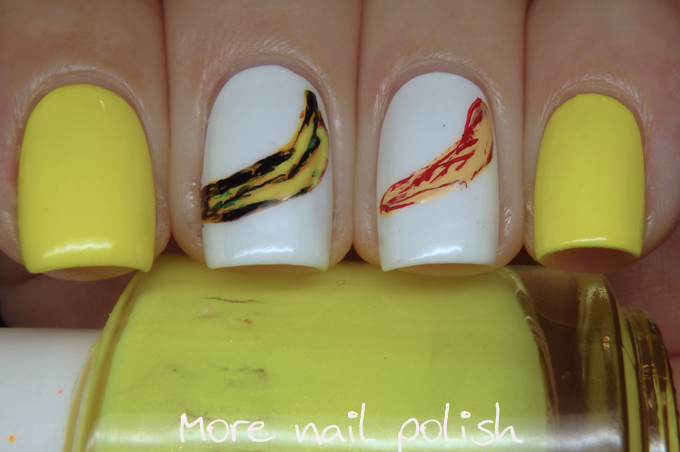 The album covers in question are for an album by The Velvet Underground and Nico, designed by Andy Warhol. It's very well known apparently. 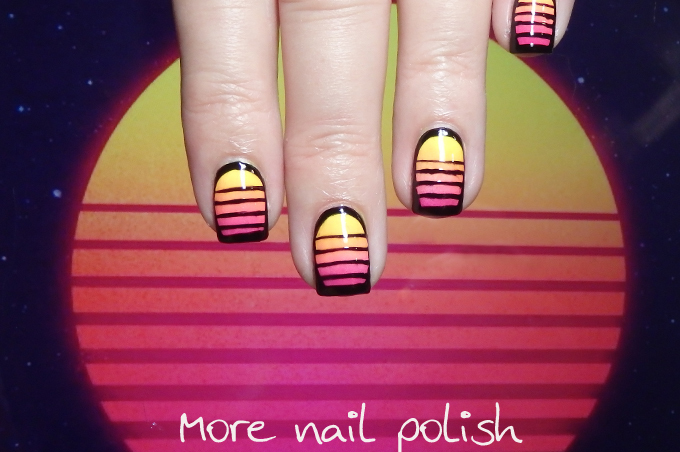 Today's album cover nail design is courtesy of FM-84 Atlas album. Who the hell is FM-84? 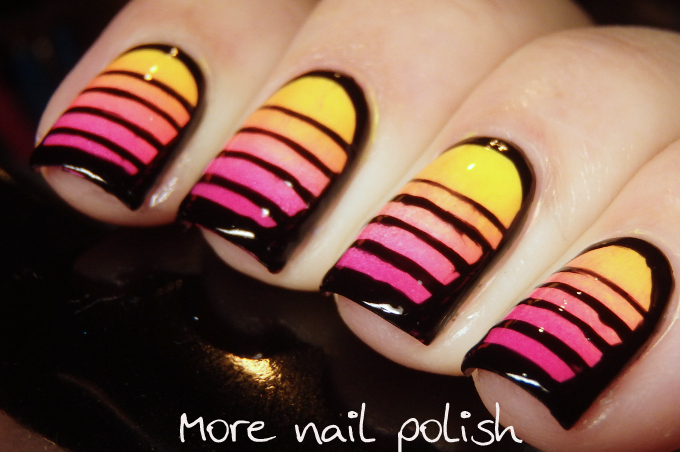 I dunno, but this album cover sure is pretty and made for some pretty cool nail art. I've got to say, I'm not a big fan of this Albums theme this month. 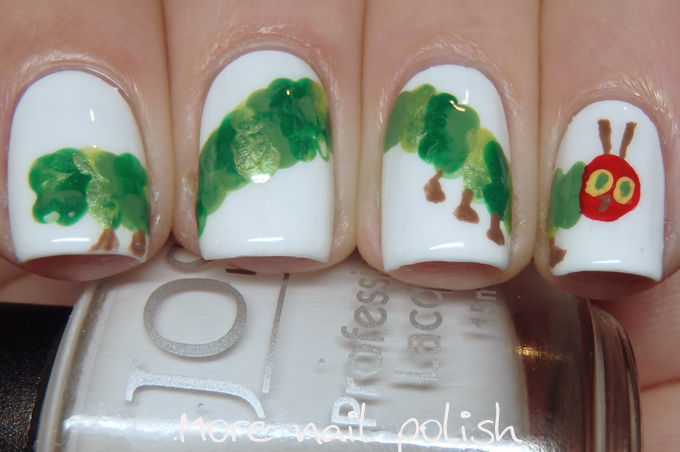 I've just finished my 5th mani, and it was a big struggle! 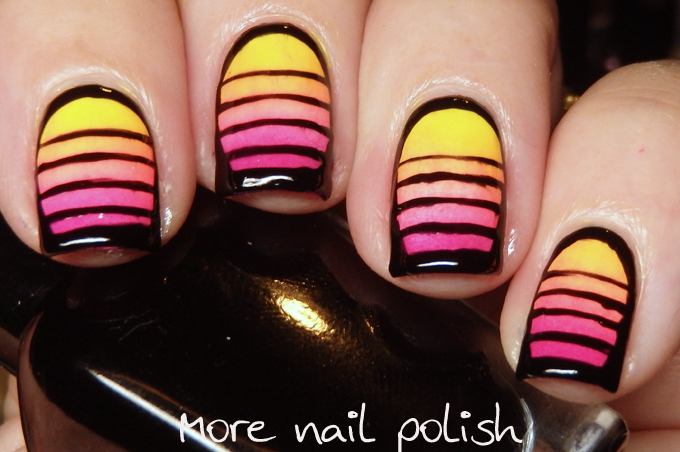 Can I also say, thin freehand horizontal lines are bloody hard! 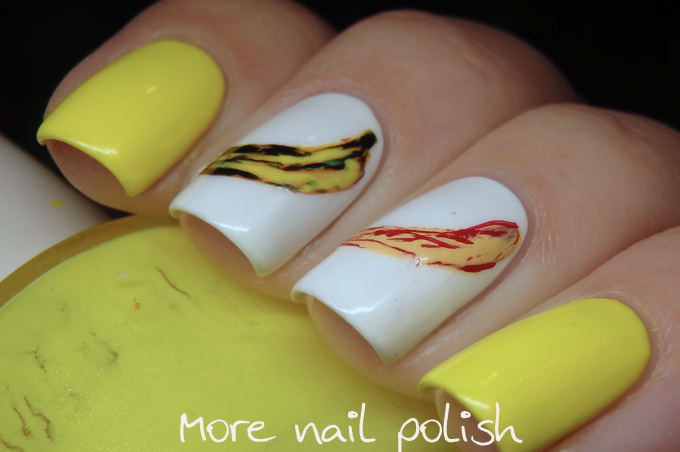 Have you every created a nail art design and put heaps of effort into it only to look at the final product and realise you could have done it in a much faster and simpler way and still go exactly the same look. That is exactly what happened with this look. 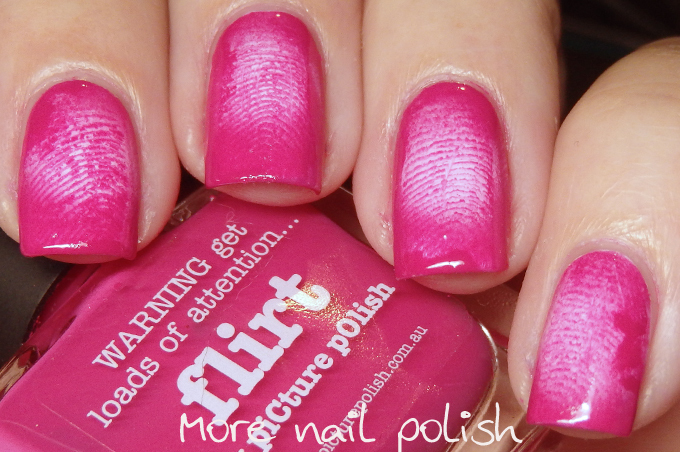 I bet if you look a this, you see a pink base with some white finger print designs on it. 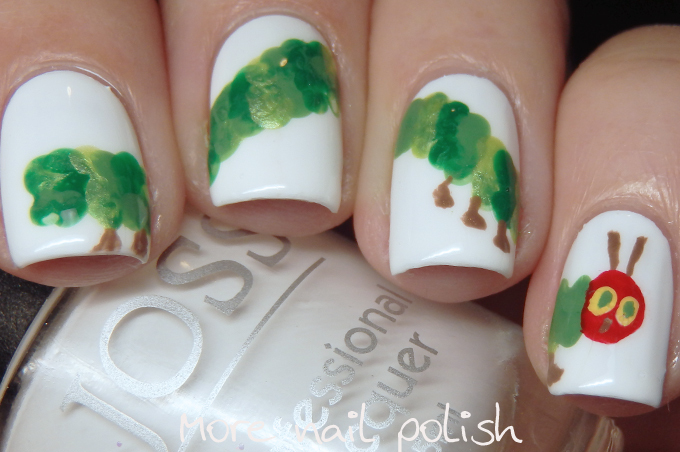 Well I just wish I had done this design in such a simple way. 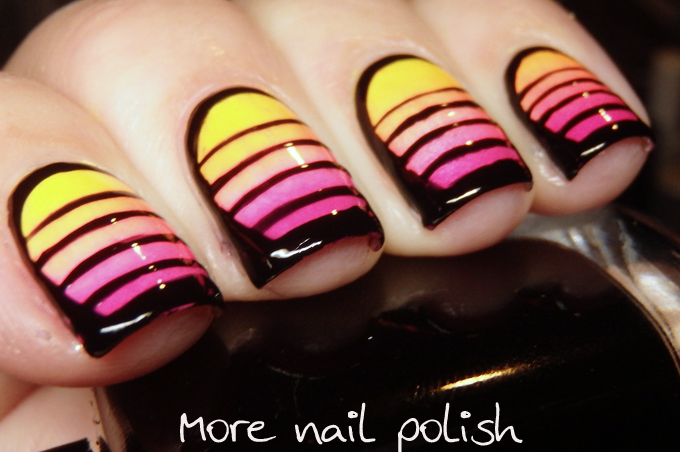 No, instead I did this design by creating a radial gradient using pink and white. 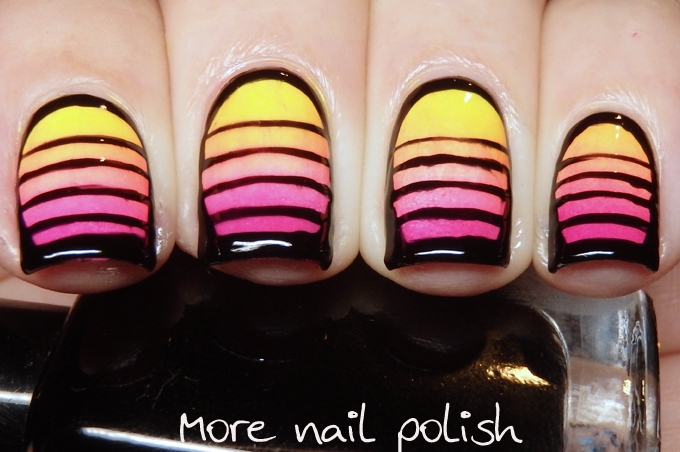 Then I did the finger print design using the pink polish over the white center part of the radial gradient. You'd never guess right. 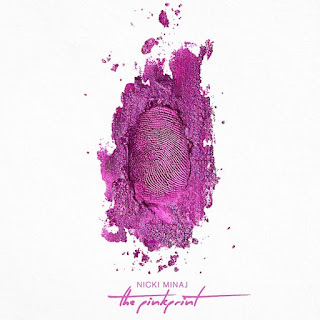 I was inspired by an album cover from Nicki Minaj called The Pink Print. 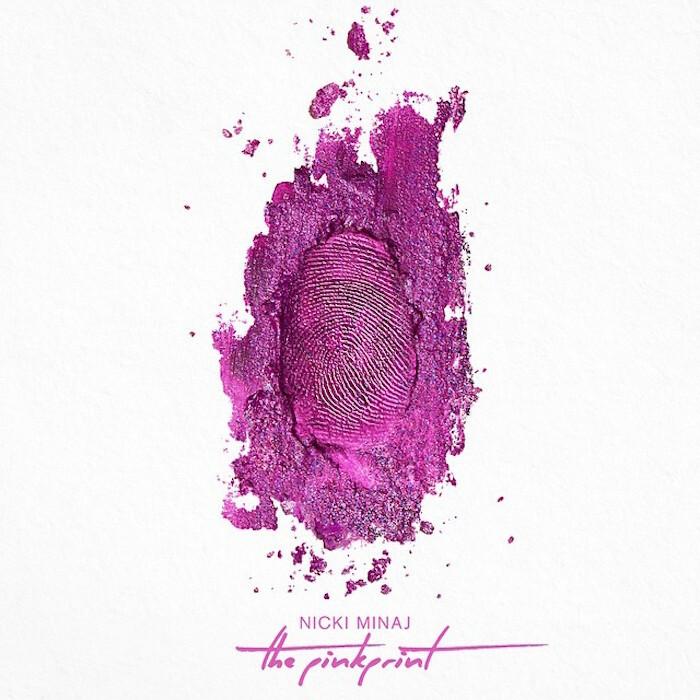 I originally tried to create a similar look as on the front of her album using loose powders, but that was an epic fail! 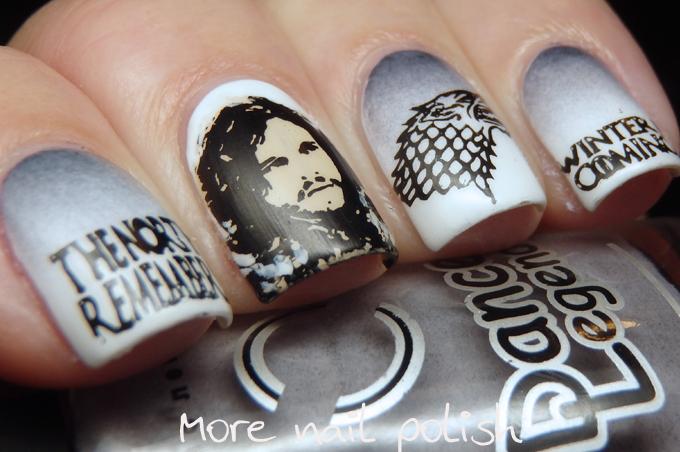 It's nearly time for another Digital Dozen week of nail art, but before I get there, I need to start the first of my Game of Thrones nail art designs ready for Episode 1 of Season 8. 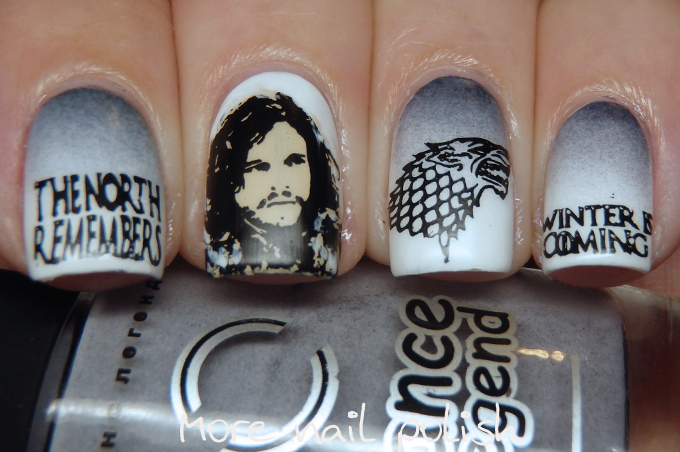 I have plans for new GoT nail art each week, ready for each new episode. Episode 1 has already aired, it was at 11am here in Australia, but because I was at work I have to wait until the kids are in bed so I can catch up. 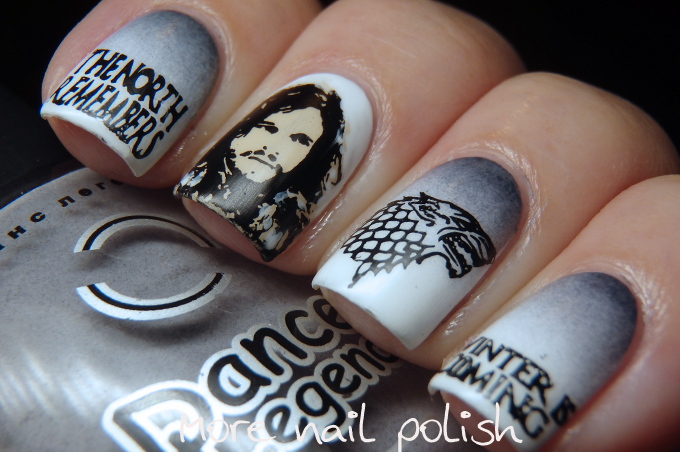 This week features Jon Snow, the Stark sigil and a few of the well known sayings for house Stark . 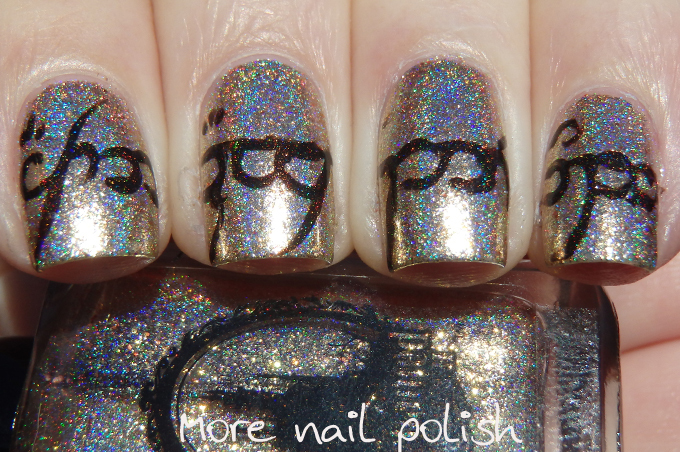 I forgot the photograph my thumb, which had the Game of Throne title image with a pretty cool vertical gradient. 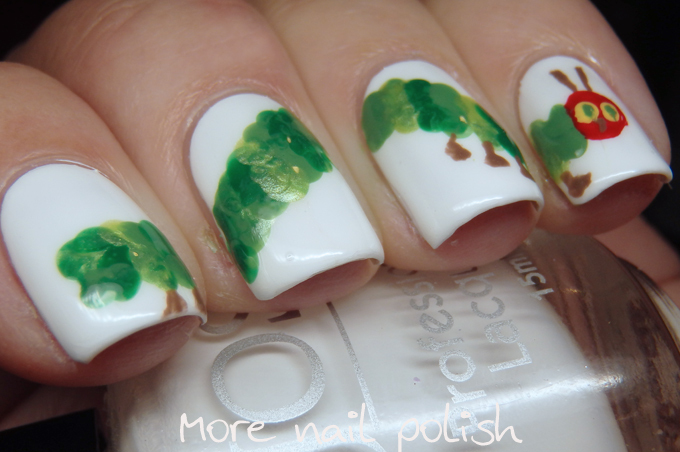 I topped it with matte top coat, which I think was just perfect for this design. 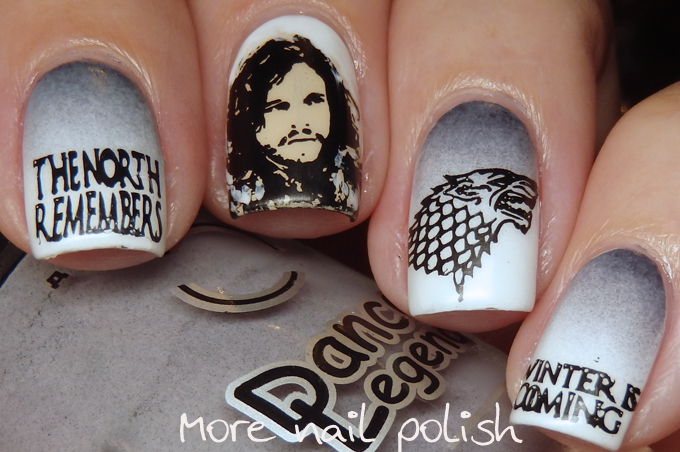 Do you watch Game of Thrones? Are you excited to see it all wrapped up? 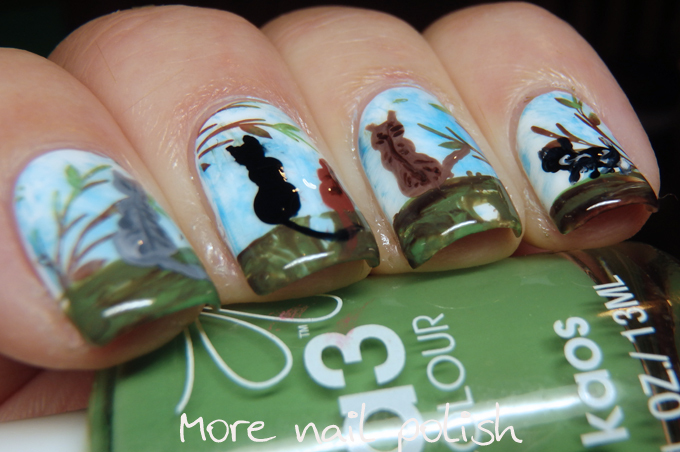 Did you do GoT nail art too, if so, let me know about it! 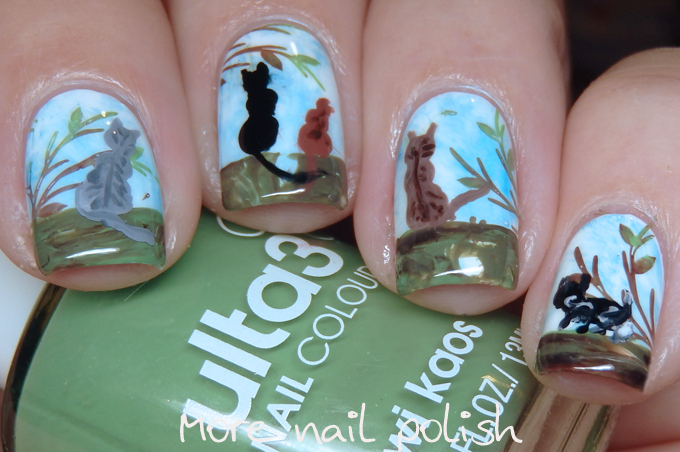 For my last book inspired mani, I've gone all out with some freehand painted nail art. 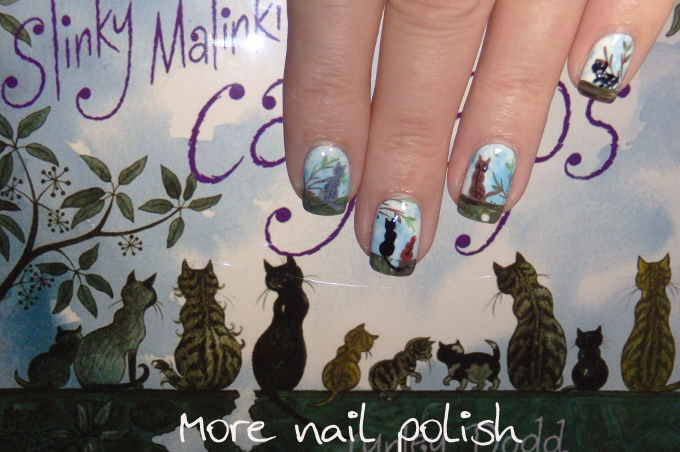 I chose to paint the cover image from Slinky Malinki Cat Flaps. I absolutely love the Slinky Malinki books. For a family with several cats, this collection of children's books from Lynley Dodd has so many relateable stories that they became a bedtime favourite book with my kids. Also drawing my love to these books is the newest little addition to our household, who is about 6-7 weeks old. We have named him Inky, and he is a tiny little black kitty who we are sure will grow up and be very similar in appearance to Mr Slinky Malinki. Slinky Malinki was blacker than black, a stalking and lurking adventurous cat. He had bright yellow eyes and a warbling wail, and a kink at the end of his very long tail. 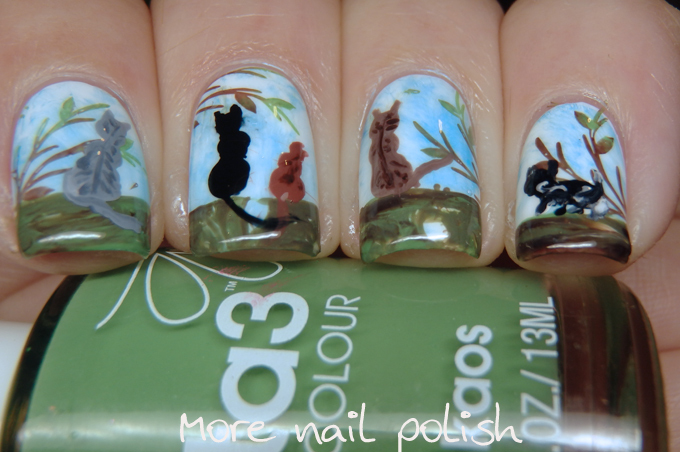 I have some more nail art inspired by kids books, because as a mum of school aged kids, their books out number my books in the household. This was a book of my daughters when she was younger, it's a cute story about a pigeon that wants to drive the bus and tries to come up with a bunch of different ways to try to convince you to let it. 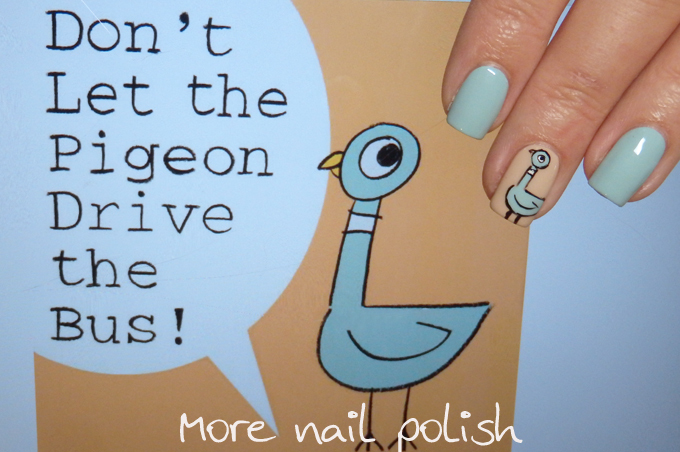 Loving how the nail art looks against the book cover from a distance. Not loving it so much up close because of my messy lines. 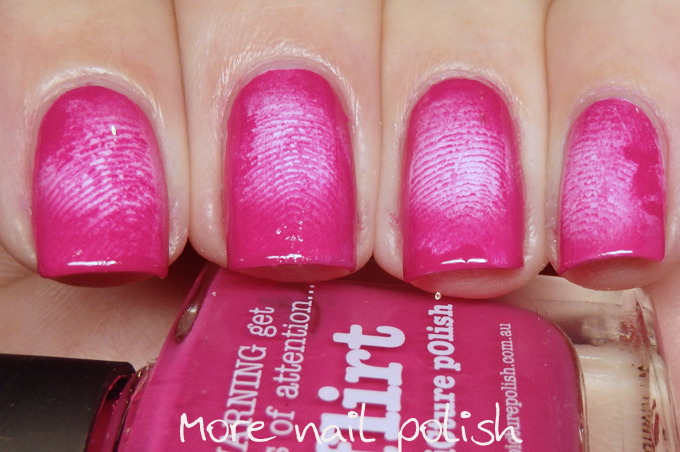 Was nice to pull out some older Ulta3 shades for this mani. The neutral shade was called Allure and the blue was Soft Hydrangea. 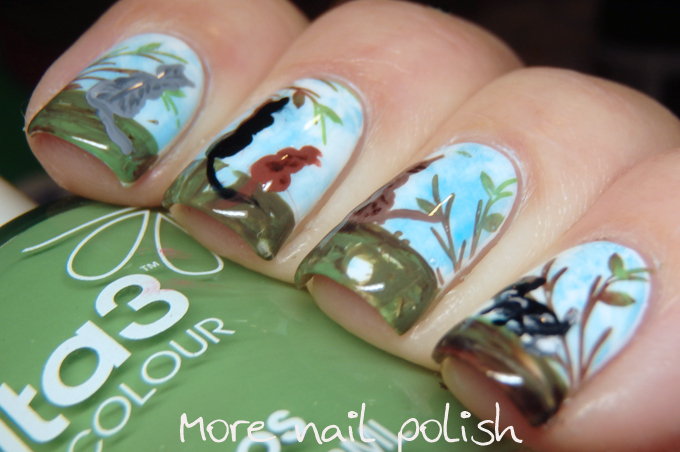 Today's book themed nail art is from Lord of the Rings, Fellowship of the Ring. 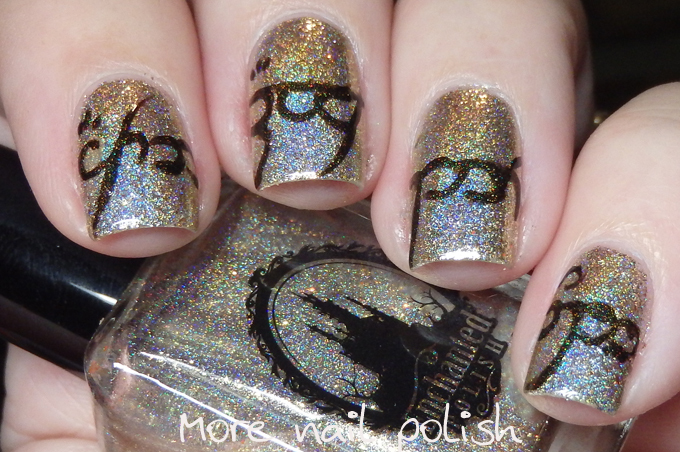 I probably should have just stuck with a regular gold foil nail polish, like Amazeballz from Lacquistry, Which I did start with, but I then decided to add some more pizzazz, and added a layer of Enchanted Polish Austin Powers. 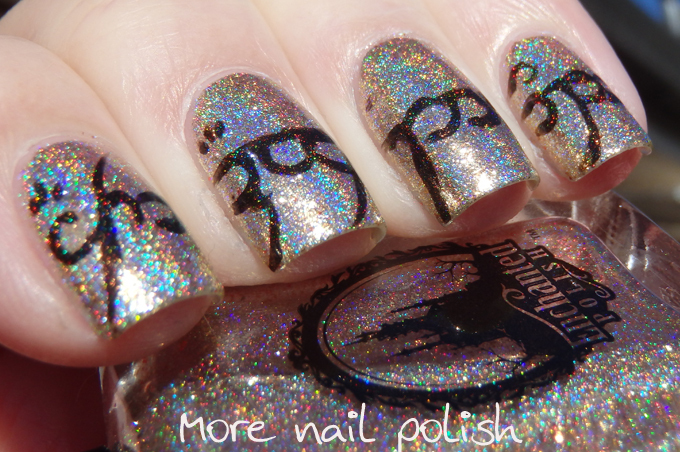 Photographing this in the sun didn't help either, as all that amazing holo goodness that is in Austin Powers just shines through, but in the shade these looked pretty amazing, like gold foil. I did the elvish script by hand. 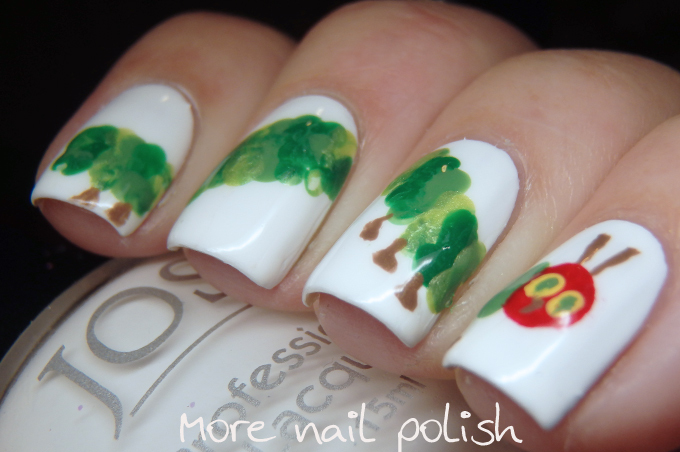 I wish I was able to make it a little smaller and finer, but this is all I could manage when painting with nail polish. 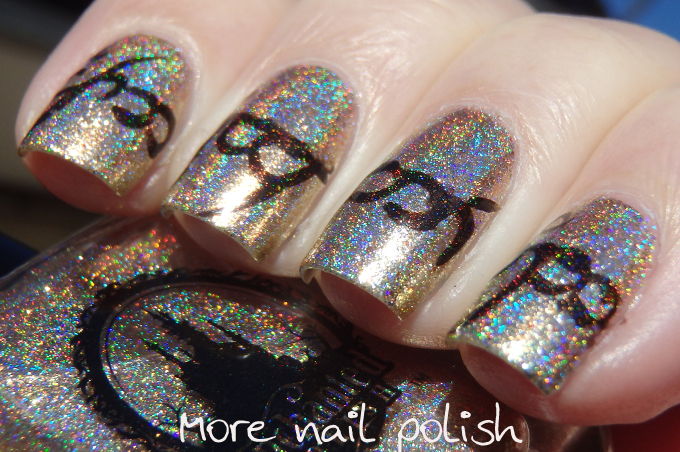 I've seen a few stamping plates that actually have the elvish print written in script, but unfortunately I don't have any of those plate, so free hand it is! No introductions necessary here I'm sure. 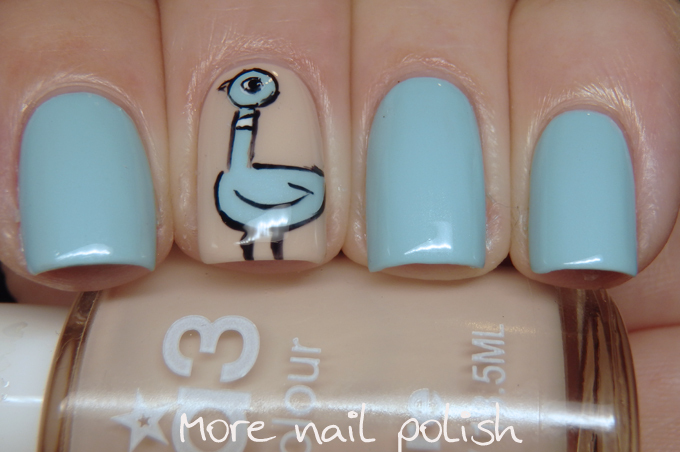 This little guy is very recognizable, and also very easy to paint as nail art. 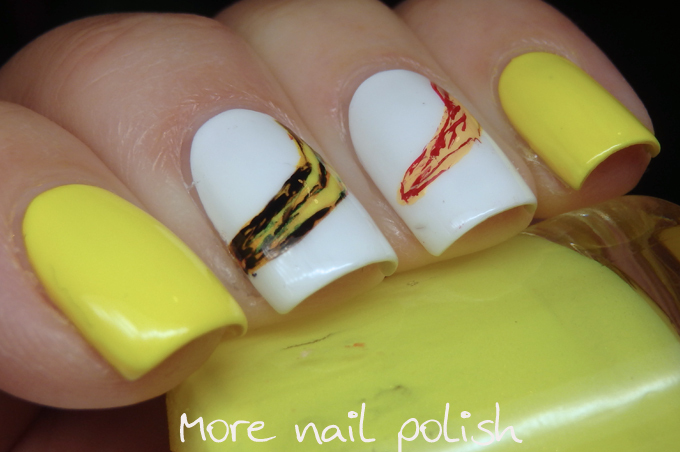 Yay for easy nail art. Eric Carle's The Very Hungry Caterpillar was my little boy's favourite book when he was one year old. 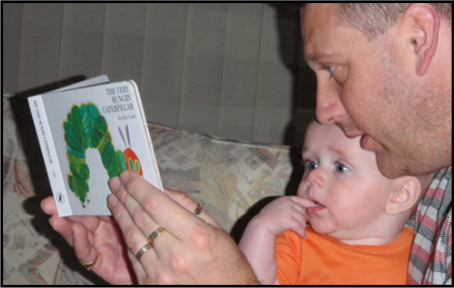 I have such an adorable photo of my husband reading this book to him, with him sitting on his lap with a look of wonder in his face. 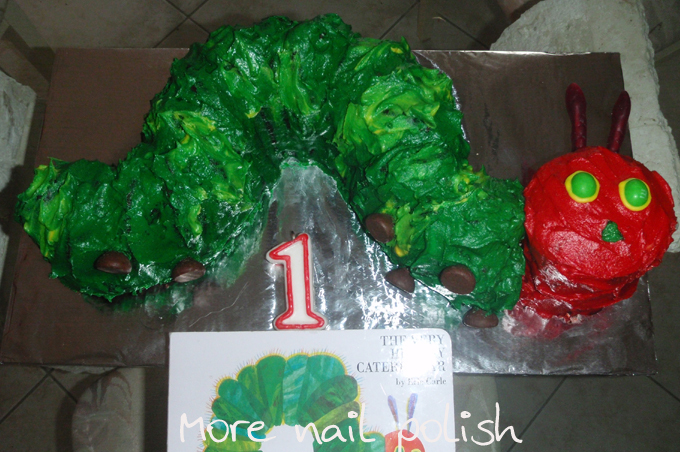 In fact I also made a Very Hungry Caterpillar cake for his first birthday.